Marking systems expert Partex has launched Partex MarkOnline, a dedicated web service where the end-user can specify and order custom labels and markers at the click of the button. Flexible and user-friendly, the website can be accessed at markonline.partex.co.uk. Featuring popular items such as control panel labels, cable, hose and pipe identification products, the new service has no upfront or setup costs. Marker plates can be quickly customised online and users can choose from a variety of materials and colours. The font, text size, base material and colour can be easily changed to suit specific technical or branding requirements. Customised laser engraving for traffolyte-style control panel labels is available for labels of any size up to 610 x 305 mm and 0.8 or 1.6 mm thick. The labels can be supplied with plain or self-adhesive backs. Laser-etched PKS 316 grade stainless steel carrier strips in various lengths and dog tags are also available from stock for rapid customization and delivery. Through the newly launched MarkOnline service, Partex is also offering engraved plates that can be created directly from the user’s Internet browser, without the need for complicated and inconvenient software downloads. 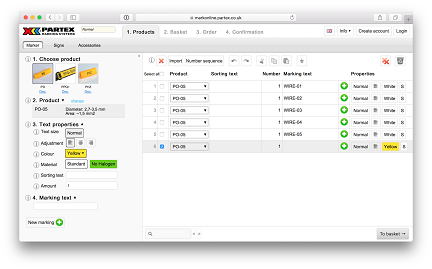 For recurring orders, customers can build and save their own templates directly into the system.